Happy Memorial Day, Monday, and unofficial official start of summer! 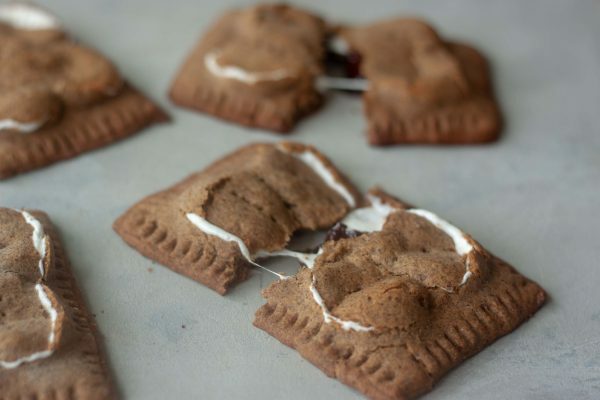 Since summer means s’mores I thought it was the perfect time to share my Gluten Free Vegan S’mores Pop Tarts that you’ve been asking for since I shared my “failed” attempt on Instagram Stories. A fail in my eyes because they puffed up and exploded but so many of you sent messages saying they looked amazing and you’d eat them. I let go of what I had envisioned and perfected the crust and yet they still cracked open which I was against at first but deflated after AND the texture is perfect. So ooey gooey good I know you’ll love these as much as my family does! We’re serious s’mores fans over here. I’m always trying to play with the flavors but the family is usually classics first and then flavor fun. They always want me to make s’mores flavored desserts. I even made my brother a jumbo giant size, using 16×16″ homemade graham crackers on the top and bottom with a cake in the middle covered in marshmallow fluff that I toasted and a few BIG chocolate bars. His birthday is in the middle of July and it was fitting since we were going to be up north with the family that year. 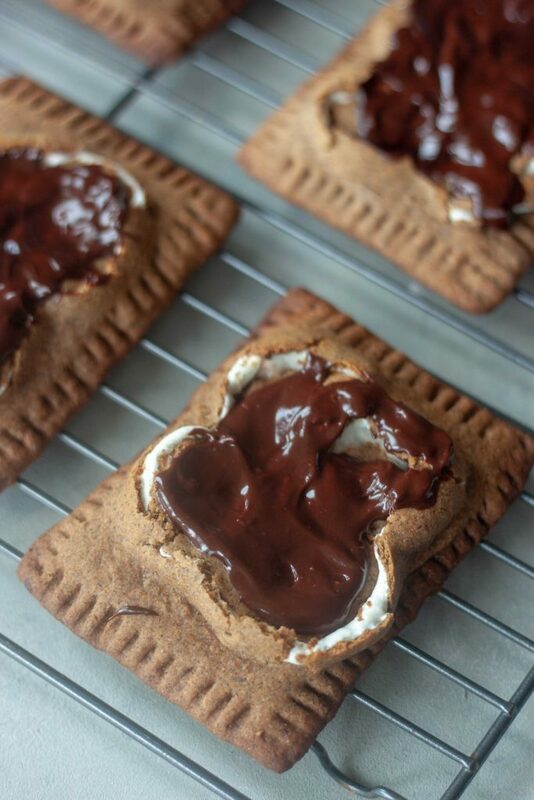 Gluten Free Vegan S’mores Pop Tarts straight out of the oven! Since my husband is a big s’mores fan I wanted to make S’mores Pop Tarts and when I posted the “fail” the messages rolled in so I couldn’t drop it or push it out. Sharing on Instagram Stories last week a day in the kitchen testing and even driving samples to have them taste tested in the middle of the day so I could get it photographed and to YOU since my followers wanted it and requested it I did my best to make it happen. Not going to lie the family really had no problem eating them all. The only “issue” once I perfected it was weather or not to top them. Mr. Whisk and S wanted chocolate ganache on top. I thought they were sweet enough and how can you take it with you if it’s got chocolate on top? And who makes a s’more and then dips it in chocolate? Not that there is anything wrong with it, sounds good but really is it needed? 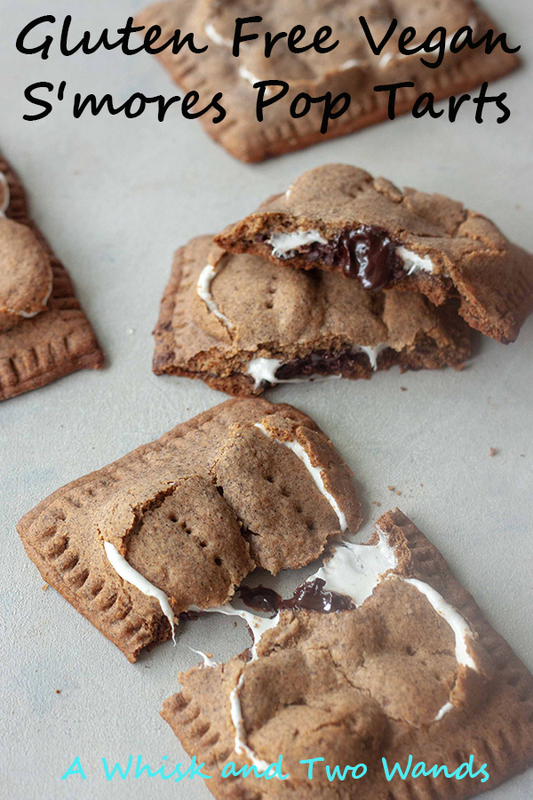 Plus it’s breakfast, or snack, or well even can be made into a S’mores Pop Tart Sundae. Hey just saying, we may or may not have tried it. So chocolate on top? I’ll leave that up to YOU! You do what you want and eat them when you want. Yes they taste like an indulging treat, and are a treat, but they are made with some pretty healthy ingredients like flax seed, coconut oil, coconut sugar, and fiber and protein packed buckwheat. Despite the name buckwheat is gluten free. I also like to use a good quality dark chocolate. Our favorites are Enjoy Like and Hu Chocolate, both dairy free and vegan. Funny thing is it was easier than I thought using my Camp Cracker (Graham Cracker) recipe I’ve tweaked over the years always trying to make a little better. One of those duh why didn’t I think of tha before I tried to tweak the other recipe I was trying to perfect for this one. The other one being one I posted on Instagram that is also paleo but made it too crispy and the marshmallows blew through. Since you’re already making them I kept the recipe size as is and bigger than other pop tart recipes. 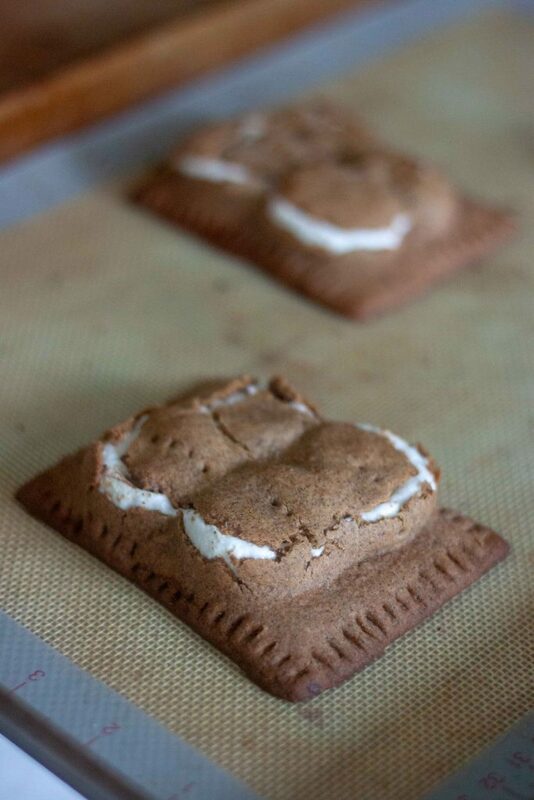 The recipe as is makes 12-13 Gluten Free Vegan S’mores Pop Tarts. If you don’t want that many you can make how many you want just adjusting the recipe using 1 marshmallow per Pop Tart and reducing the amount of chocolate. Then use the remaining dough to make Gluten Free Vegan Graham Crackers, aka Camp Crackers. They freeze well and you can pull them out the next time you make s’mores, or just eat them. I haven’t tried freezing the pop tarts yet as they disappeared but that would also be an option and I would just recommend baking, letting them cool, and reheating as needed. I will update the recipe and post once I’m able to test it. I just didn’t want to leave everyone hanging. 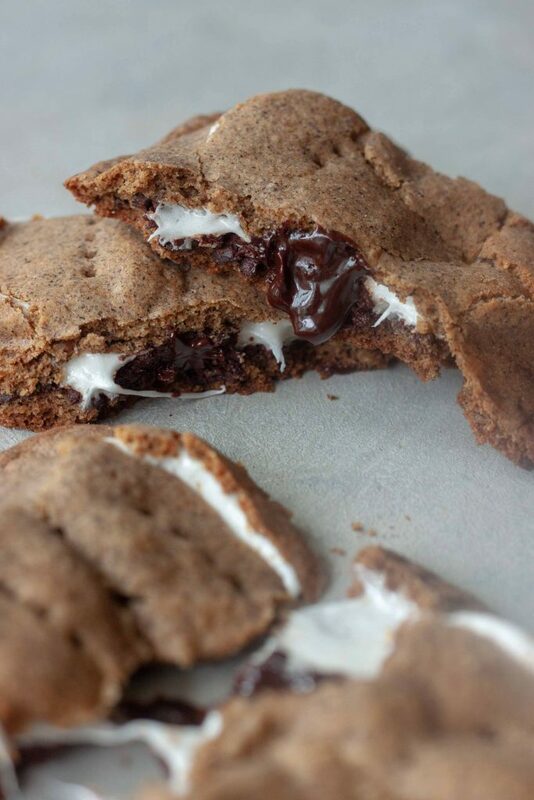 So ooey gooey good I know you’ll love these as much as my family does! 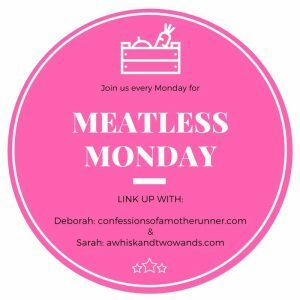 Can’t skip a Monday, even if it’s Memorial Day it’s still Meatless Monday over here on the blog. I look forward to seeing what’s happening in your kitchen and hope you link up with me and my co-host Deborah. I also hope you check out and are inspired by the recipes linked up below. 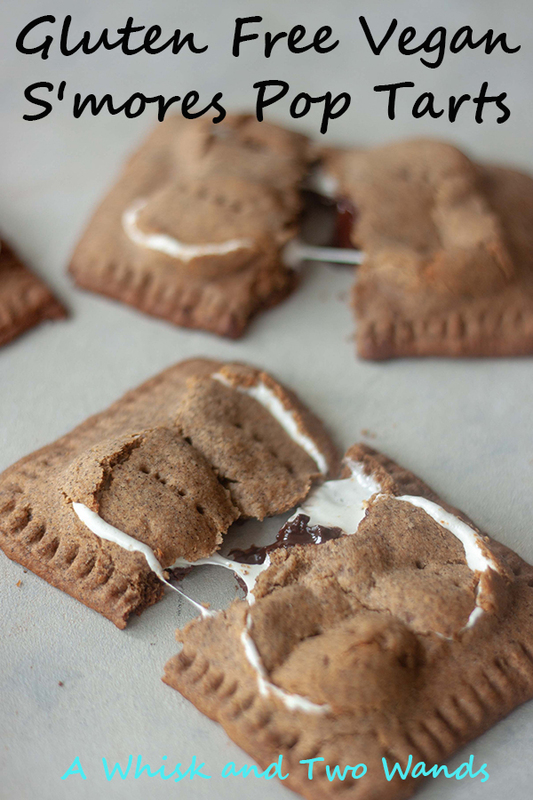 Gluten Free Vegan S'mores Pop Tarts are a fun, fresh, and healthier twist on classic pop tarts and a classic summer treat, s'mores! No campfire needed and an acceptable way to enjoy s'mores for breakfast! In a food processor pulse together flours, flaxseed, cinnamon, baking soda, sale, and coconut palm sugar. Add in vanilla, maple syrup, coconut oil, and coconut cream and pulse until dough comes together. Alternately in a large bowl combine dry ingredients. In a smaller bowl combine wet ingredients, then mix in with the dry ingredients. Form dough into a ball with your hands. Place dough in the refrigerator for 30 minutes, or until you are ready to make them but no longer than a day. Note: If you are chilling the dough more than 30 minutes you will need to pull it out 10-20 minutes before making it so you can roll it out without it crumbling. Remove dough from the refrigerator and place half of the dough on a piece of parchment paper, then place another sheet of wax paper on top and use a rolling pin to flatten the dough until about 1/8" thick or about the thickness of pie crust. Remove top sheet of parchment paper and cut into 3x4" rectangles with a pizza cutter or plastic pastry/bench scrapper. Or I like to use a fondant mat, with gridlines, and sprinkle with a little buckwheat flour and roll it out with a fondant roller or pastry roller (without handles). I use a plastic pastry scrapper to help pick the rectangles up. You will have to do this in batches as you would cutting cookies. Lay half of the rectangles on silpat or parchment paper lined baking sheets. Top each one with a spoonful of finely chopped chocolate and 1 marshmallow, cut into 4 circles 2x2 on top of the chocolate. Add a little more chocolate if desired. Poke remaining rectangles with a fork in the middle or on top of where each marshmallow will be. Wet the edges of a rectangle that is topped with chocolate and marshmallows with water using your finger. Top with top sheet of pastry poked with holes and pinch around the edges, pressing down in the middle with the palm of your hand if the top pastry does not met the edges of the bottom due to the marshmallows. Go around the edges gently pressing with a fork. Let cool 5 minutes before moving to a wire rack. If desired top with ganache, heating milk and adding to chocolate or heating them in a metal bowl over a pot of simmering water. Once smooth spoon over pop tarts. Let chocolate set 10 minutes. *You can also make this with just all purpose gluten free flour or for non gluten free sub all purpose or wheat flour. ** For my normal graham crackers I use 1/2-2/3 cup coconut palm sugar, usually 1/2c. As these are filled with a sweet filling I reduced it. If you're making graham crackers and pop tarts you may want to use 1/2 cup of coconut palm sugar. You can’t, especially when the family LOVES s’mores! I hear you I think I could go for just the chocolate too! 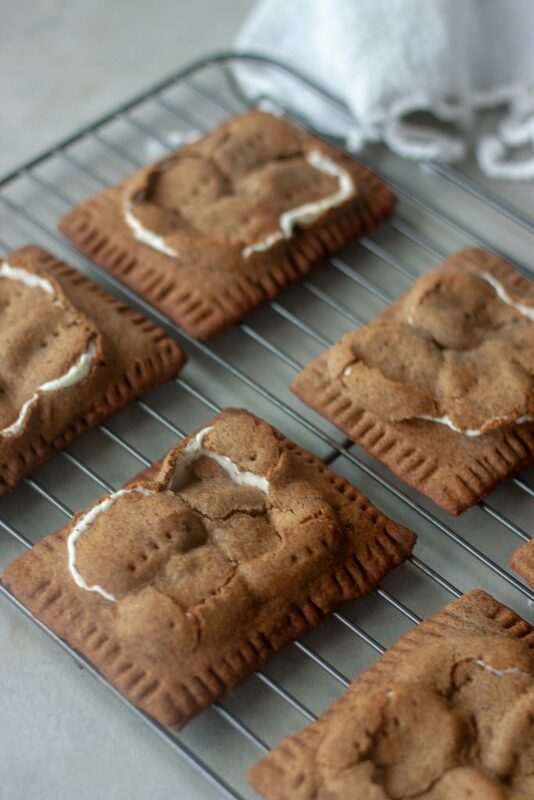 Your poptarts look better than the store bought ones! So much better, but honestly I can’t remember the last time I had a store bought one. ‘Tis the season for S’mores! This is definitely a perfect snack. This smores are really delicious. It is 100% kids approved. Can’t wait to make another batch this weekend. Wow! These look amazing! My gluten free vegan kids will go crazy for these!